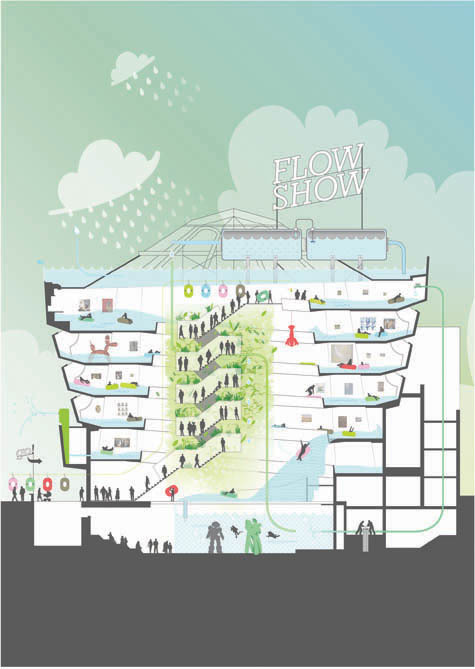 [Image: Flow Show by WORKac (2009)]. 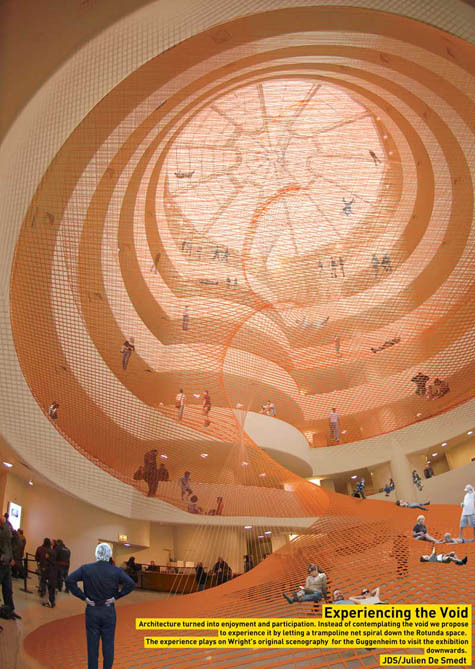 For a forthcoming exhibition called Contemplating the Void, New York's Guggenheim Museum "invited more than two hundred artists, architects, and designers to imagine their dream interventions in the space." In this exhibition of ideal projects, certain themes emerge, including the return to nature in its primordial state, the desire to climb the building, the interplay of light and space, the interest in diaphanous effects as a counterpoint to the concrete structure, and the impact of sound on the environment. Many of the images provide great eye-candy, as you'll see, and I've included the best of those here (with my personal favorite coming up in the next post). [Image: Untitled by N55 (2009)]. The interior is taken over by coastal rain forests; there are mystical arabesques of colored music wrapping upward in spatially impossible curls through the museum's disappeared roof; there are trampolines and climbing nets strung from wall to wall above the lobby. The Museum of Simulated Suicides, you could call it, where go to experience what it might be like to throw themselves into the void. You get a certificate of survival at the end. [Images: (top) Let's Jump! by MVRDV (2009) and (bottom) Experiencing the Void by Julien De Smedt Architects (2009), the latter project also depicted in Agenda, pubished earlier this month]. 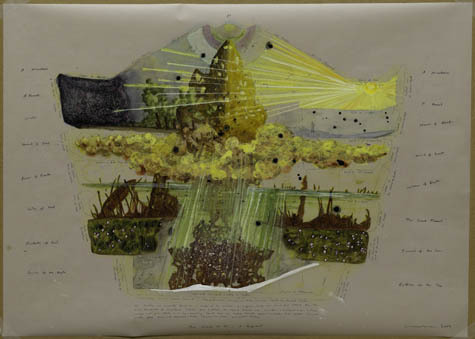 There are photo-collages and sectional diagrams of internally returning ecosystems. 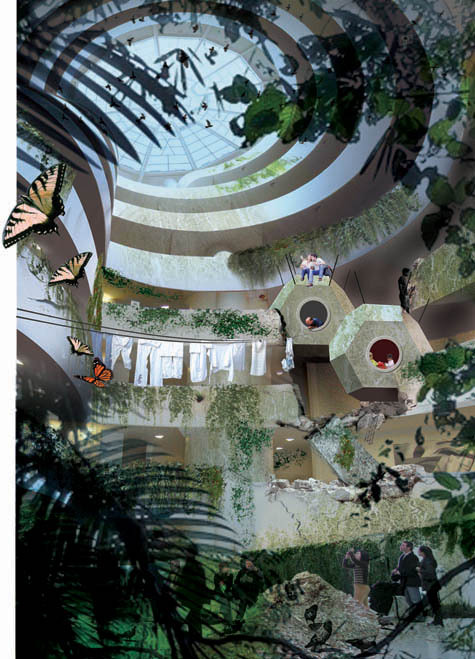 [Images: (top) Morris in Guggenheim by M/M (2009), (center) Perfection_Perversion by West 8 (2009), and (bottom) The House of GI–A Proposal by Matthew Ritchie (2009)]. 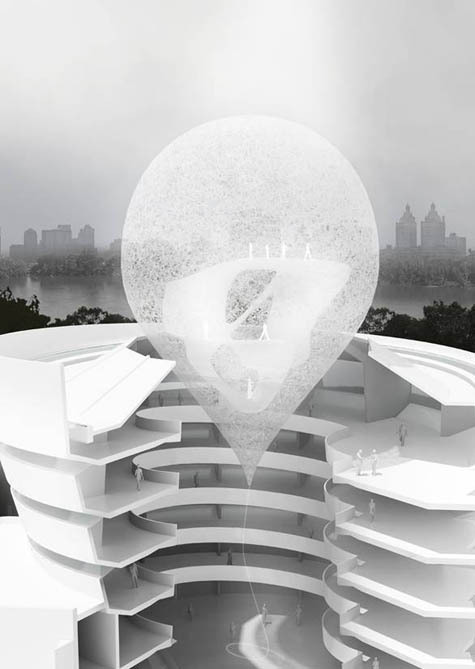 [Image: State Fair Guggenheim by MAD Architects (2009)]. —as well as storms of red dust falling downward in a kind of gravitational pollution of the lobby. 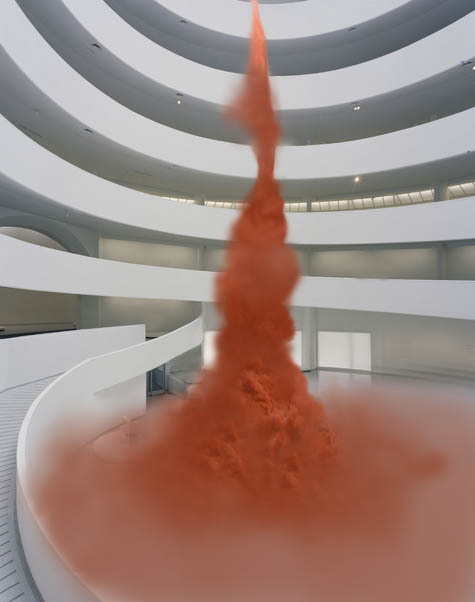 [Image: Untitled by Anish Kapoor (2009)]. 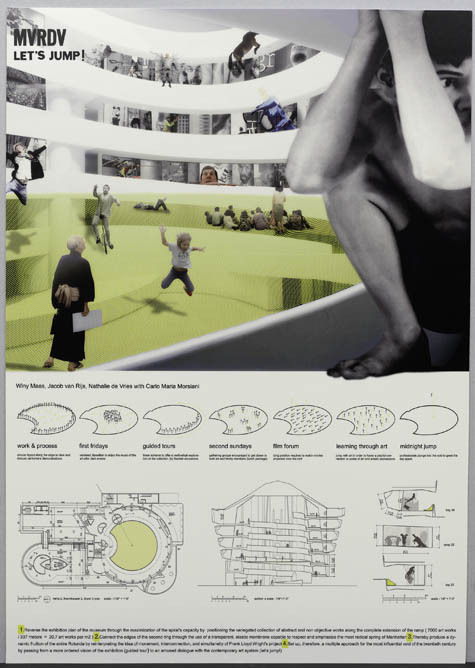 Perhaps predictably, though, I might say an even better intervention into the Guggenheim's space is not a series of objects or architectural alterations at all, but an event—by which I'm specifically referring to one of 2009's most talked-about spatial moments, at least in architectural circles, when we see that very same museum annihilated in a hail of bullets in the film The International. 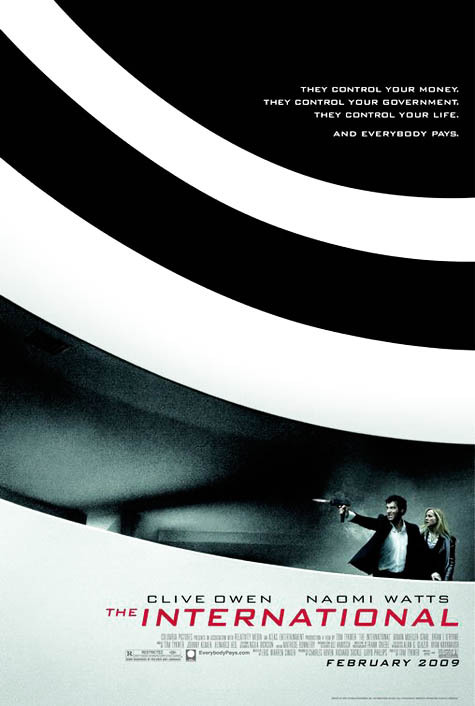 [Image: A poster for The International featuring the Guggenheim Museum (2009)]. For all these calls for ideas and architectural design competitions, what if Hollywood set designers and location scouts are doing a more provocative job in non-preciously reimagining the inherited icons of the global built environment than 21st century architects? 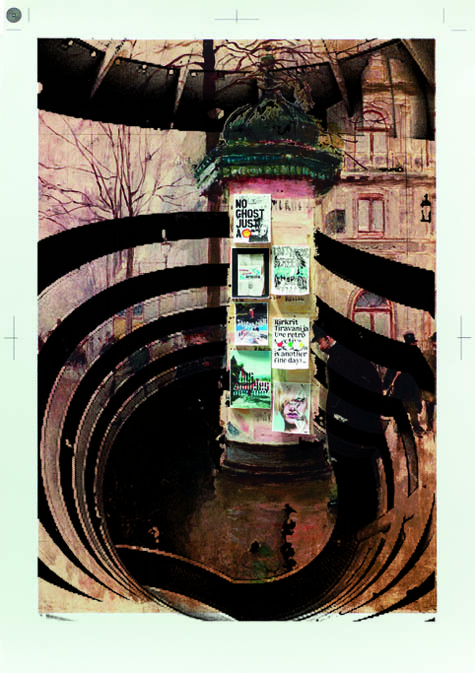 These and many other images will be on display when the exhibition, Contemplating the Void, opens February 12, 2010.